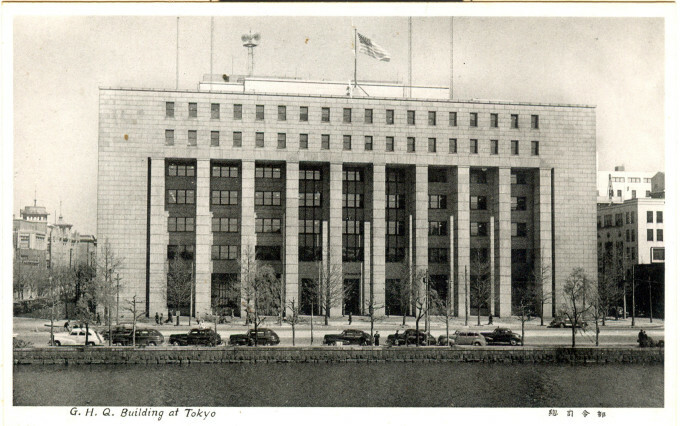 Dai-Ichi Seimei Sogo building, Marunouchi, c. 1949. Dai-ichi Sogo builidng, Marunouchi, c. 1949. Flying the Stars-and-Stripes above the General Headquarters (GHQ) of the Occupation of Japan (1945-1952). “We were glad when we reached Tokyo, where the destruction was bad enough, too, but where at least some parts of the city had been spared in anticipation of the Allied occupation. 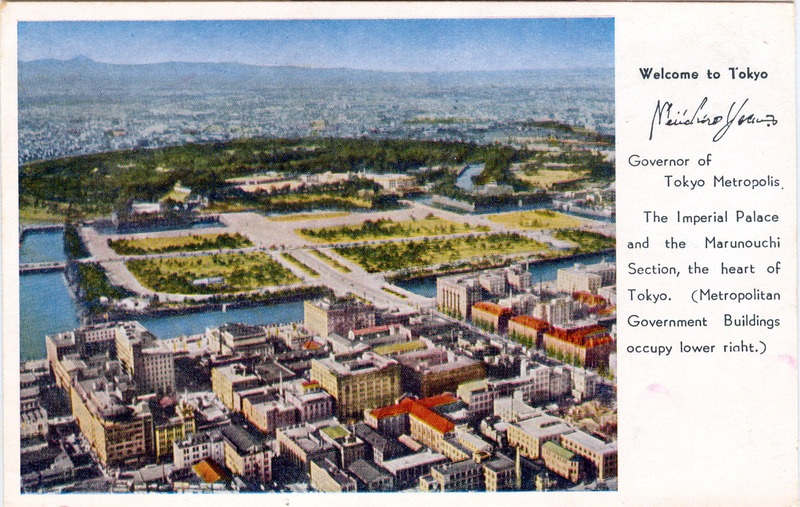 This was evidently true of the area along the Imperial moat, where the impressive Dai Ichi Sogo building was located. 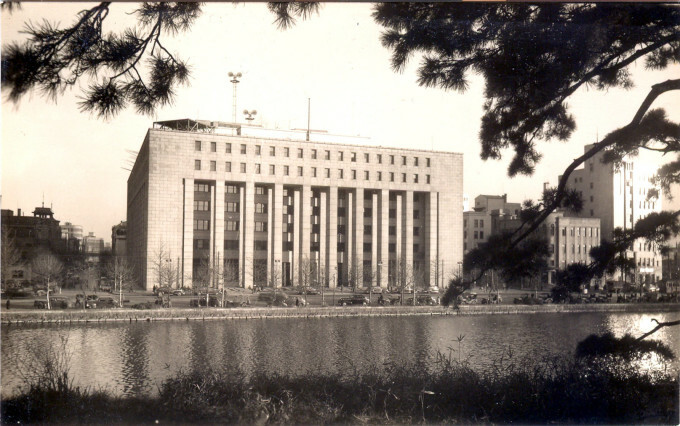 Previously occupied by a giant insurance company, it now served as the seat of the General Headquarters (GHQ) under the American general with the title Supreme Commander for the Allied Powers, abbreviated SCAP. This establishment, also known as SCAP, was a microcosm in itself, born quite suddenly in the middle of an alien world. It had all the ingredients of a giant bureaucracy, with ambitious chiefs who were sometimes rivals for the favor the top man. A view across a palace moat at the Dai-ichi Sogo building, c. 1946. Dai-ichi Sogo building (right), Imperial Theater (center), and Tokyo Kaikan (left), c. 1950. Aerial view of the Marunouchi business district, post-Occupation, c. 1960. 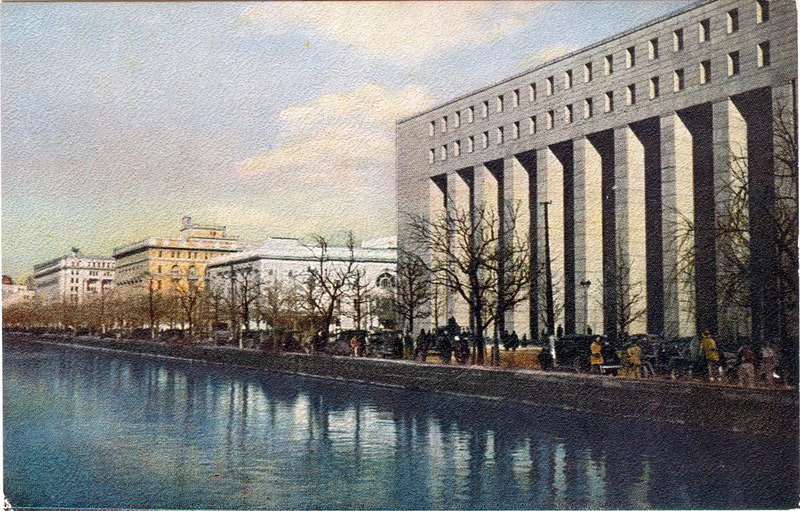 The Meiji Insurance Co. building sits in at center-left on the boulevard abutting the palace moat. 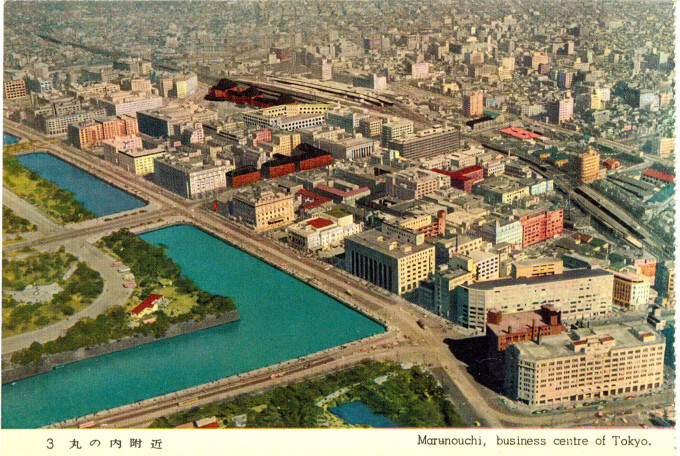 An aerial view of the Marunouchi business district, post-Occupation, c. 1960. The Dai Ichi Sogo building can been seen at lower-left; the Meiji Insurance Co. building at center-right.